My experience is that, I had two beautiful dreams on 27 April 2018 and 28 April 2018. On April 27th at about mid night-morning I had a beautiful dream, that I was invited for lunch by my Captain in AASM Saturday jaap. I went over there and we were sitting in the living room and just having a conversation about my family, as we were talking I saw a mandir. In the mandir there was Sai Baba's frame of 3-4 feet which was surrounded by lightings and other idols. When I returned back at my hostel I had a missed call of dad. And my dad had called my roommate and told him and said him to convey the message to me that "Line lag gayi hai tu tension mat le", It means that "We have got progress in the business so you don't get tensed" and live peacefully and concentrate on your studies. On the other side my mom called me and was asking about me and my hostel mess food. My mess food was not that good sometimes I would be unable to eat the food as it used to be so tasteless. Then my mom told me that "Don't worry about money, go outside and eat whatever you want to eat and everything is fine over here". 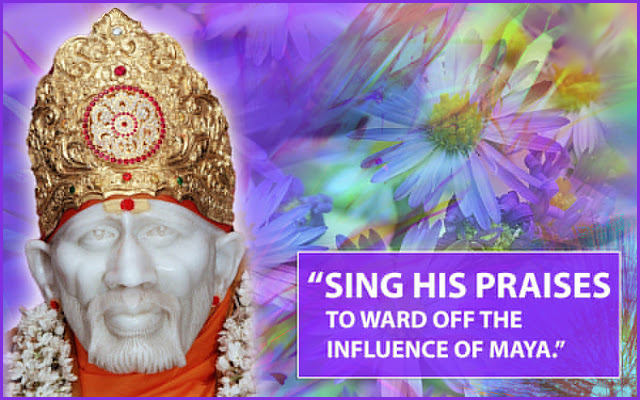 After listening these statements my happiness knew no bounds and thanked my Sai. As we had some business and financial problems currently happening in the business and Sai just helped us in coming out of these situation. When I woke up I realized it was a dream and told Sai that You have given me this message so You only have to fulfil it and handle every situation and everything. On 28th April I had my 2nd experience, where in my dream I and my mom we went to Shirdi for Baba's darshan. As we reached Shirdi we directly reached the Mukhdarshan Hall and we were unable to get into the queue. Then there was an old age room in a Corner of a hall where all the aged people were sitting and then I went and asked an old man about the darshan and he told me that "Go inside, Baba is sitting there", then we went ahead and there was an old man sitting there. We met Him and had a talk with Him. He was Baba's Roop only. Baba gave us darshan in the form of that old man. That was Baba's leela and we were feeling so blessed after meeting that old man. Baba called me to Shirdi in the form of a dream and gave me darshan in the dream. I hope that Baba calls me to Shirdi very soon and He is looking after us always and is there with us in every situation and in any form. He gives us darshan in any form just we have to notice it. Feeling blessed to share these two beautiful dreams which is a wonderful leela of Baba. I am feeling very happy to share these experiences with all the devotees of Baba. Baba is always there with everyone. Visit to Shirdi is auspicious and seeing Baba in dream is also equally auspicious where millions of devotees everyday wish to see Baba atleast once in their dreams. Then what to speak of dream with Baba in Shirdi where He Himself gets the Shirdi to us through dreams! Unfathomable leelas! Love You Deva. Jai Jai Ho Sai. He is very lucky to have the dreams.